Cabin crew members on the first day of a five-day strike at Heathrow Airport on May 24. London, England (CNN) -- British Airways has hinted at possible legal action over the strike by cabin crew, saying Wednesday it had written to remind their union to "retain all relevant paperwork." "This is standard legal procedure for all pending court cases," a BA spokesman said in a statement. The current strike is due to end Friday, but the Unite union plans two more walkouts in the next few weeks. BA said the letter to Unite does not mean it is appealing the decision by a London court this month, which overturned an injunction to stop the strikes. In seeking the injunction, BA had claimed of irregularities in the way Unite polled its members. "The union would have been fully aware that the point of law over the communication of the strike ballot result would come to a full court case in due course," said the BA spokesman, who asked not to be named in line with policy. Is British Airways' reputation in a tailspin? British Airways said Tuesday it was managing to fly despite the strike. More than 70 percent of its passengers were able to take their flights Monday, BA said. Figures were not yet available for Tuesday. Unite, which represents most of British Airways' 15,000 cabin crew, said Tuesday the strike was "holding well." 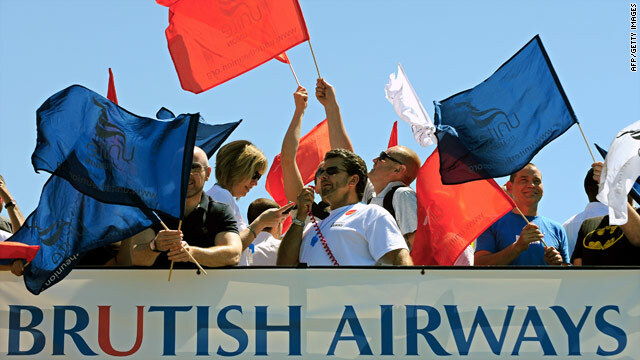 The dispute is over pay and working conditions for cabin crew members, including BA's plans to reduce the number of cabin crew on some flights. BA says it is a cost-saving measure, but the union says it will help to damage the BA brand.